This is one member of the dolphin family you wouldn't want to mess with. In spite of their name, killer whales are actually a large species of dolphin. Also known as orcas, killer whales have no natural predators other than man. They are some of the fiercest predators of the ocean. There are two different types of killer whales: transients and residents. Transient killer whales migrate throughout the oceans and generally eat more mammals than fish. Resident killer whales usually stay in one specific habitat with an abundance of fish to eat. Both kinds of killer whales are "toothed." They usually have four rows of 10 to 12 sharp teeth, for a total of at least 40. Their teeth are not designed for chewing. Killer whales rip and tear their prey before swallowing it in chunks. But even that might not be necessary, as killer whales have large enough mouths and throats to swallow a whole seal. Think about it: How big would your mouth have to be to hold 50 teeth? Killer whales are sometimes called "wolves of the sea" because of their unique social and hunting habits. They travel in pods that range anywhere from 5 to 60 whales. Occasionally, lone whales will hunt and travel alone, but this is rare. Like humans, they have different accents and languages. Killer whales make unique sounds in their pods. 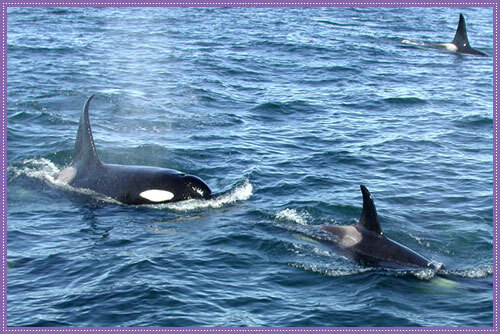 They can recognize their own pod's sound and distinguish the sound from another group of killer whales. 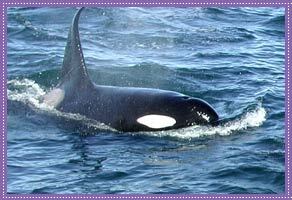 Studies have shown that resident killer whales tend to make more sounds than transient orcas. This could be because transient whales rely on stealth to trap their prey, while residents have to coordinate complicated hunting strategies. Both types can be extremely clever and ferocious when hunting. When hunting schools of fish, they encircle their prey before attacking from several sides. Sometimes they "beach" themselves, swimming up the shore of land or ice to feed or scare marine mammals into the water. If a helpless seal tries a swimming escape, it might find the waters quite dangerous. Several other killer whales could be waiting in the water, to feast on the prey their comrade frightened. Think about it: How are orcas like wolves? What's on the Menu? Everything. While transient and resident killer whales have different eating habits, neither type could be considered a picky eater. Researchers have found an incredible variety of meals in killer whales' stomachs. Along with a variety of fish, scientists have found squid, seals, walruses, sharks, penguins, turtles and even polar bears. Killer whales don't fear any creatures, on land or sea. They can attack and kill blue whales, the largest mammals on earth. They can easily destroy fearsome great white sharks and sometimes scavenge the remains of other killer whales. Researchers have even found the remains of a moose in a killer whale's belly! Exactly how did that poor moose get there? Think about it: Make up a story about the killer whale that caught a moose. Killer whales are mostly black, with white patches on their bellies and around their eyes. Their sickle-shaped dorsal fins are very distinct to their species. A male killer whale's fin can grow up to six feet long. Female killer whales have smaller dorsal fins and are usually smaller in size. They generally grow to about 20-25 feet long and weigh around 4 tons. Male orcas are usually longer and heavier, growing to about 25-30 feet long and weighing a hefty 8-10 tons. Killer whales have keen eyesight, both in and out of water. Occasionally, they will "spy-hop" their heads out of the water to take a peek at potential prey. Killer whales have one blowhole, and can dive hundreds of feet under the water. Think about it: What does a whale do to "spy-hop"? Next time you go swimming, try it for yourself. After around 16 months, female orcas give birth. The mothers and female pod members give careful attention to their calves. The calves begin nursing from their mothers and within a few days form thick blubber to insulate them in the cold water. Killer whales' milk has six times the protein of a human mother's milk. The calves can make sounds soon after birth. They immediately become members of the pod, and are often protected and taught to hunt by several females in the group. Calves soon become strong swimmers, though they have a lot of work to do if they want to keep up with the adults. Adult killer whales are some of the fastest whales in the world, swimming as quickly as 30 miles per hour. Think about it: How does blubber help the calves in cold water? Scientists don't really know how long most killer whales live, but estimate that they usually survive between 30 and 60 years. Researchers can estimate a killer whale's life by inspecting the layers of their cone-shaped teeth. Because they have no natural predators, killer whales generally die of disease, infection, or old age. Occasionally, sharks might prey on old or sick killer whales. For the most part, these "wolves of the sea" survive as the most fearsome predators in the ocean. Think about it: The movie "Free Willy" stars an orca whose real name was Keiko. Because Keiko lived in captivity for nearly all of his life, he relied on humans to feed him, and when he was released into the ocean again, he didn't know how to hunt for his own food. 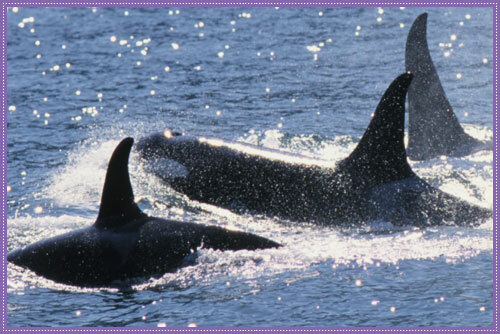 Learn more about Keiko online, or check out the DVD for a family movie night! Image provided by Anchorage Daily News.